Vibrant church in Etobicoke, Toronto with roots in the Korean immigrant community. So let us not grow weary in doing what is right, for we will reap at harvest time, if we do not give up. The purpose of inner voice is for people to reflect on good thought every morning. It takes only five minutes to read if you want to read it, but if you want to think about it the whole day, you can use it to meditate on it the whole day. So it’s a very short meditation, so far I have about 120 subscribers and so if you are interested in it, some people use it quite effectively and spiritually, they tell me that every morning they read it either on the GO train or bus or just read it quickly and then think it over for the whole day. So if you are interested in it, go to the website. The first one has instructions so you can read the instruction for the first one, and you can see today’s June fourth, so continuously 365 days a year you will be able to get it. Today I like to talk about giving up because these days I see a lot of people give up too easily. I like to think about giving up. Giving up is an easy way out. Scripture, Galatians six, nine. “So let us not grow weary in doing what is right for we will reap at harvest time if we do not give up.” Very short passage. So I was thinking about giving up. Giving up is an easy way out and we can always give up, that’s the easiest way to deal with our problems. Just walk away. That’s easiest, but it should be the last. That’s not the best way to deal with our problems every time. I don’t think, if that is our lifestyle, then we can never achieve anything. We’ll always give up in the middle of doing things. We may start well, but we won’t be able to finish it. Don’t you realize that whatever you do, you always hit the wall, don’t you? I mean, whatever I do, I always hit the wall, plateau. It doesn’t get any better whether you play sports at a certain point, you don’t get any better. Even some great players, they go through a slump, and then they just don’t get out of it for a year or two, or if you’re an artist, you’re imagination is kind of fixed and limited, you cannot do anything any better. So I know this sculptor and he got an award. He was just going crazy, every day, he’s reading all kinds of books to get inspiration, but nothing comes. Also writers, they often tell me that when they see a blank page, they get really scared because nothing good comes. Even in a relationship, we hit a wall at a certain point. Our relationship doesn’t go anywhere, and the wall is so high and so strong that it makes us feel so helpless and hopeless. We feel so powerless and small in, in front of this big, huge wall. That’s why we give up and turn around and we say to ourselves, I have no power within me to break that wall and I have no choice but to give up. That is a logical conclusion. That is a logical conclusion and sensible conclusion, maybe that’s why I believe that we cannot live just simply by the logic. We always faced the wall that is too high and too strong. No matter what we do, we can logically explain why we gave up and we can logically explain well, why we stopped running. No matter how logical that may be, that’s not what I want. That’s not what I need. I don’t need to explain logically why I gave up. I’m not interested in why I gave up. I’m not interested in a logical explanation of why I have given up. I believe that people have become victims of their own logic. They don’t see beyond that. Their own logic gives justification for giving up too easily. They have a very good reason why they give up, but they become a slave to their failure and to their own logic, they become victims of their own limitation, so I don’t think it is good to simply live by logic. It doesn’t get us too far. I want to live by faith. I want to embrace the mysterious aspect of my life by faith. Saint Paul said “we walk by faith, not by sight. We walk by faith, not just logic.” Hebrews writer said, “now faith is the assurance of things hoped for, the conviction of things not seen.” Whenever you hit the wall, that is when you should turn to faith. Whenever you feel helpless and hopeless, I hope that you can try to turn to faith. Don’t just try to break the wall. Sometimes when you try to break the wall, you feel helpless and hopeless. Your weaknesses will overwhelm you. You will be exhausted and then soon give up. When you turn to faith, you will see something more than the wall. You know this image came to me when I was writing this sermon; There is a door on the wall. Somehow this image is given to; my door on the wall. When you see your wall with faith, you can see the door on the wall. You don’t need to break the wall. You just go through the door through faith, you’ll be able to see the open door. You know, Jacob’s life was always running away from the beginning. He had to run away from Israel, all his life he ran away. At the end of his journey, he could not run away from his life problems anymore. He had to face his own life challenges, so this time he decided not to run away. He decided to face it. That’s why he wrestled all night with this unknown figure. To Jacob, the wall of his life was Esau, but he didn’t have to break the wall. He didn’t have to destroy Esau to move on. Mysteriously, Esau turned around and accepted Jacob. He never expected that. That was an open door to Jacob. On the wall, there was an open door. We don’t know how our life will turn out. We don’t know how our problems get solved. We don’t know what the future holds for us. The important thing is to believe that what I’m doing is worthwhile. I’m doing good things. It is good work that I do while I do ministry, many times I have experienced the wall, but every time I have believed that what I’m doing is worthwhile, it is valuable, and God always, every time he showed me the way. So it’s just important that you believe that what you’re doing is valuable, important worth it. It reminds me of what Isaiah said “I am about to do a new thing. Now it springs forth, do you not perceive it? I’ll make a way in the wilderness and rivers in the desert, away in the wilderness, the rivers, in the desert”. There is no way in the wilderness, there is no river in the desert, so there’s no door on the wall. So rivers are the way, they are like doors, St Paul said, “So let us not grow weary in doing what is right, for we will reap at harvest time if we don’t give up.”. Yes, I believe that if we believe all we do is right, then we should not give up. God will show us the way and he will. We will. We will reap when the right time comes.” Second Chronicle said the same thing, but as for you, be strong and do not give up for your work will be rewarded. You do a good thing, you don’t give up and ultimately you’ll reap rewards when the right time comes. 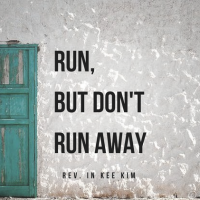 Run, but when you face the wall, don’t run away. Turn to God, have faith in God. You may not have the power to break the wall, but you may be able to see the opening. As you look at your own life, didn’t you experience that one moment in your life where it goes nowhere? You’re stuck. There’s no way out. I felt in many times, there’s no way out. I’m stuck here. I’m so helpless and hopeless, but somehow there was an opening. I don’t know how that opening came about, and I was able to go through that opening and life opened up. My friend’s life is like that. Sometimes you feel you’re stuck. You go nowhere, your life goes nowhere. You look around, there’s no way out, but with faith, you will see a small, small opening opened up for you, and when you go through that opening, the whole new world opens up for you. I do believe that there’s a faith journey you cannot see that by logic alone, only by faith. You’ll be able to see that opening, then your life will open up. Otherwise, you’ll be stuck in your own situation. I hope to be all have eyes of faith so thou life moves on beyond the wall that we hit. Rev. In Kee Kim is the senior minister of St. Timothy Presbyterian Church. A church in Etobicoke, Toronto with roots in the Korean immigrant community. An inclusive and welcoming community that stands with the weak and vulnerable and places study of Scriptures as central in its life.